My sister's mother-in-law (Who is what to me? I have no idea. Hmm ... My brother-in-laws mother. No idea how, or if, we'd be considered related.) 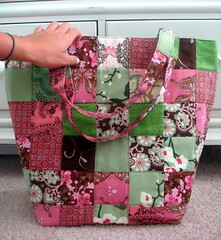 asked for a bag like this one that I made for my sister last Christmas. But she wanted it bigger - taller, wider, and deeper. I thought the first one was pretty dang big, but Marge needed it even bigger to suit her needs. 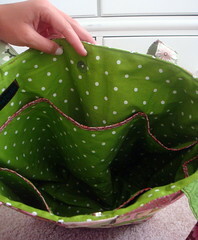 So I made her a really big bag, with a wider bottom. And I like it. 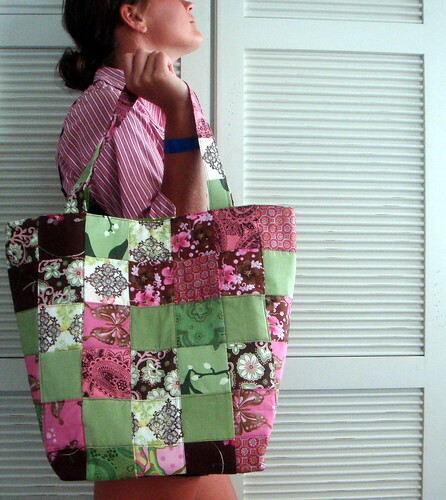 It's big, but it makes sense, and according to People Magazine really big bags are in style now. Yup, not only full of possibilities, but trendy too. The bag is constructed much the same as the original, nothing really new or different to it. And yes...it's good to have a big bag! Usually I don't plan on having much in it...just a wallet and diaper, but it's nice to have the option to make it a crap collector for the day!